Yesterday’s signals were not triggered, as the price never quite reached the support level at 1.2828. Trades may only be taken between 8am and 5pm London time today. Long entry following a bullish price action reversal on the H1 time frame immediately upon the next touch of 1.2828. Short entry following a bearish price action reversal on the H1 time frame immediately upon the next touch of 1.2923. I wrote yesterday that the best I could say was that the support level at 1.2828 looked very pivotal, so if there was a strong bullish bounce there later, I would take a cautiously bullish bias. There was a strong bounce close to that level, but it was never quite reached. 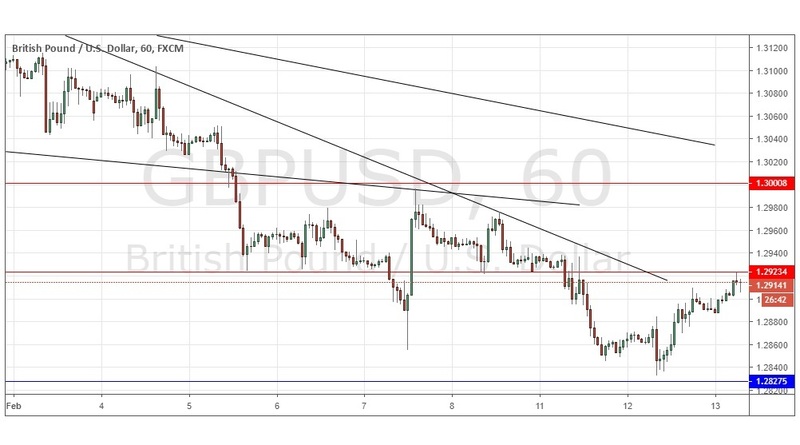 The price then rose from there and at the time of writing has just made a bearish rejection of the nearest resistance level at 1.2923, although the rejection is quite weak. There should still be some medium-term bearish pressure weighing the price down, but if the price can get established above 1.2923 as the London session gets underway, that would be a mildly bullish sign. It is likely to be today’s pivotal level, but I have no directional bias at this point. There are also data releases on both sides which may push the price around in a surprising way which does not respect technical levels. Concerning the GBP, there will be a release of CPI data at 9:30am London time. Regarding the USD, there will be a release of CPI data at 1:30pm.